I figured I would see him before he died. 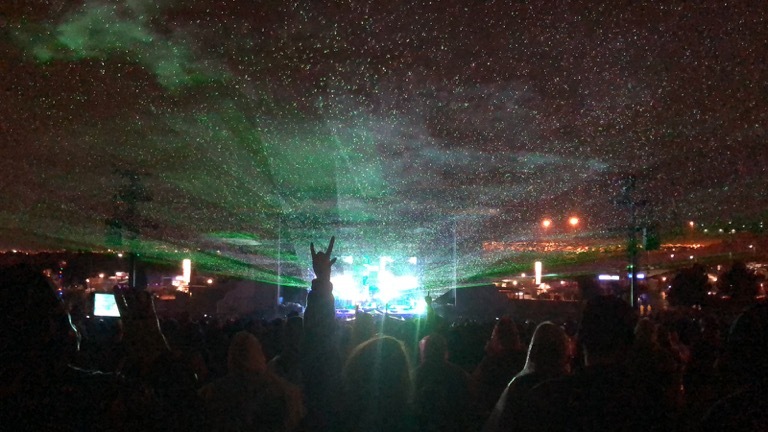 And the rain made for a beautiful laser show. By no stretch of the imagination am I a fan of Ozzy Osbourne. But after some legendary artists have been kicking the bucket the last few years, I decided to start seeing “legends,” whether I like them or not. What I find most enjoyable about these shows of legends is not usually the artist. It’s the thousands of lifetime fans. They sing along with passion. At some point, they’ve had moments in their life where these artists helped them get through something. 🍺 Or maybe they had their first beer when they were underage. 💋 Their first kiss at a show. Maybe they met their significant other at this artist’s concert decades ago. I adore that they adore these artists. I don’t care what you love in life.